With I SOLITI IGNOTI (UNKNOWN, AS USUAL), a new Italian film star was born and the star was a comedian: Vittorio Gassman. The following year confirmed it with LA GRANDE GUERRA (THE GREAT WAR), again by Monicelli, which has already been discussed with regard to Sordi, who was teamed up with Gassman. In IL MATTATORE (THE MUMMER: 1960) by Dino Risi, the actor finally had a vehicle devised and tailored especially for him, where, through the story of an international swindler who presents himself in different disguises, he could show off all his virtuoso skill in constantly changing make-up and character. Risi is the director most responsible for consolidating Gassman's role within the framework of Italian-style comedy. 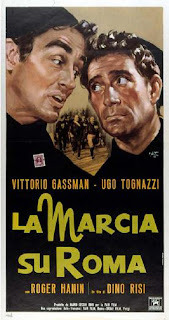 In LA MARCIA SU ROMA (THE MARCH ON ROME: 1962), he replaces the team of opposites, Gassman-Sordi, invented by Monicelli, with the team of Gassman and Ugo Tognazzi. The march on Rome was a parody of revolution, that is the march on the Capital by four different columns of Fascists in 1922, poorly equipped and under-armed, which would have taken only a few soldiers to stop. But the King, as is know, didn't have the courage to give orders to fire and yielded, immediately after giving the task of forming the government to Mussolini, who hadn't taken part in the march and cautiously staying in Milan, ready to flee to Switzerland if things turned out for the worse; and when the King summoned him to Rome, he demanded a written invitation so as to avoid any nasty surprises, then rode down in a sleeping-car like any normal citizen. To base a film on the "march" of one of these columns from the North to the Capital was a good idea. Ghigo De Chiara, Continenza, Age, Scarpelli, Scola and Maccari wrote the script. The parts played by Gassman and Tognazzi resemble the ones that had given them success: the former is a cocky, blustering Fascist, basically naive deep down inside, like the Giovanni Busacca in LA GRANDE GUERRA (THE GREAT WAR); the latter a slightly dim-witted farmboy, convinced by Fascism but prepared to take stock of reality, like IL FEDERALE (THE FEDERALIST) in Salce's film.